These are things I said repeatedly to my children when they were little. But now that my kids are all taller than me, it would be strange to still insist on doing their hair. It would be insulting to tell my teens to not to touch breakables or to stay in bed till I came. I was a good mom of littles. I kept little fingers away from electrical outlets and little feet away from roads. I oversaw every bite of food my kids ate and every show they watched. I trained them to say, “Yes, Mommy,” and come when I called. I was really good at being in control of my little kids. What I’ve wrestled with far more is giving up control as they grow. Really the only thing that fits into Category 1 is me. I can control my own actions, responses, and attitudes. But everything else belongs in Category 2. I can’t ultimately control what other people do or what happens around me. Dr. Sanford suggests that good parents HOLD and FOLD, respectively. For Category 1, we should HOLD responsibility for ourselves—for our actions and reactions. But for Category 2 (everything else), we must learn to FOLD our hands and trust God rather than trying to control what we ultimately can’t (pp. 60–70). I would add that that these responses change as our children grow. Here’s a good rule of thumb: When my child is small enough to hold, it is good and right to HOLD responsibility for her and control her environment. The smaller my child, the more I must control what she eats, wears, or touches. She is my responsibility! But gradually as my child becomes too big to hold or pick up, it’s time to transition to FOLDing. I’ll always have influence over my child, but little by little I must entrust him or her back to God. And when my children are fully grown, I must give up control completely. Trying to control what I ultimately cannot will only make everyone (me included) miserable. I laughed. The ages of seven to twelve are years of great transition. Yes, your child might still sit on your lap, but no, you shouldn’t scold him if he crosses the street without holding your hand. Picture yourself straddling the line between Category 1 and Category 2 during these transition years. Sometimes you’ll need to HOLD; other times you’ll have to FOLD. You’ll need wisdom from God as you parent your particular child on how much independence to introduce when. For me, this process of being completely responsible for my newborn babies to relinquishing more control each year has been extremely painful and difficult. Giving my daughter keys to her first car seemed like something only a crazy mother would do! And sometimes letting my son walk out of the house in the clothes he’s chosen seems even crazier! But trying to control like I did when they were small would drive us all crazy. First Peter 5:7 says, “Casting all your anxieties on him, because he cares for you.” I love that this chapter of 1 Peter is written to people who “shepherd the flock of God that is among you” (v. 2), because that is how I see myself. I am a mom, shepherding my little flock of children, who belong to God. And yes, this role creates a lot of anxiety in me! But rather than rolling His eyes when I start fretting over my child’s grades or friendships or habit of throwing clothes on the floor, God leans down with an invitation. He says, “Why don’t you fling those burdens up on my back?” And why should I do this? Because God cares for me. His intentions toward me are tender and kind when He reminds me that I was never intended to struggle under my burden of trying to control my child’s entire life. 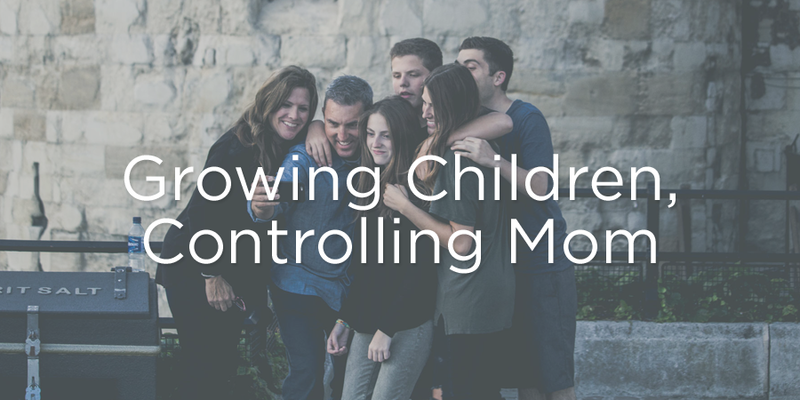 As my children grow, I have less control, but God does not! I can FOLD my hands and entrust them to Him, knowing He’s the good, caring Shepherd who has everything under control. What anxieties do you struggle with related to your children? Is God asking you to lay down some burden of control that you aren’t meant to carry? Thank God that He is the Good Shepherd who tenderly cares for both you and your kids. I hope you’ll pick up my book when it comes out (hopefully by Nov. 2016). It’s certainly not my success story, but it’s where I want to go–From Control Girl to Jesus Girl.